One of the most electrifying rock bands of all time, recreated live on stage by our country's No 1 award-winning Queen cover artists. Remember those heady days at Live Aid or the fantastic live concerts around the world?. Queen was undoubtedly one of the world's top rock bands back in the 80's. Fronted by the inimitable Freddie Mercury they exploded onto the Rock music scene and ruled it for the next decade. Now, with Freddie sadly no longer with us, there is a real desire for shows that recreate the magic of this great group. Looking for the authentic look and sound of Brian, John, Freddie and Roger?. The Queen cover band scene has at its very peak the UKs greatest group, Killer Queen. These guys can recreate the authentic experience at arena or club level and are second to none in the quality of their act. With worldwide appearances, the band are famous on the entertainment circuit for the popularity and professionalism of their show. They have worked with a number of successful artists, including members of the original group and Bob Geldof in connection with Live Aid. The show itself is a full-on stage production that doesn't skimp on presentation, sound quality or effects. This really is a full show of the type more normally seen at headliner act gigs and nationwide tours. Expect a high-octane, super sound system production that will leave your audience open-mouthed at the authenticity of it all. Presenting Queen's greatest hits, we recommend Killer Queen to you unreservedly. We don't have a great number of Queen shows on our books because no one else comes close to the quality of this act. Spectacular, breathtaking, nostalgic and fun, contact us to enjoy this group's fantastic appearance at your event. Don't hang around, though - they are incredibly popular entertainment, we kid you not. These guys are guaranteed to blow your mind! This show is hugely popular. 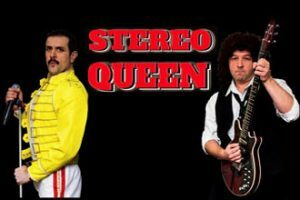 Book this Queen tribute band now for UK or International appearances.